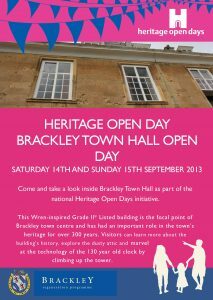 On Saturday 14th and Sunday 15th September 2013 Brackley Town Hall is open as part of the nationwide Heritage Open Days initiative. 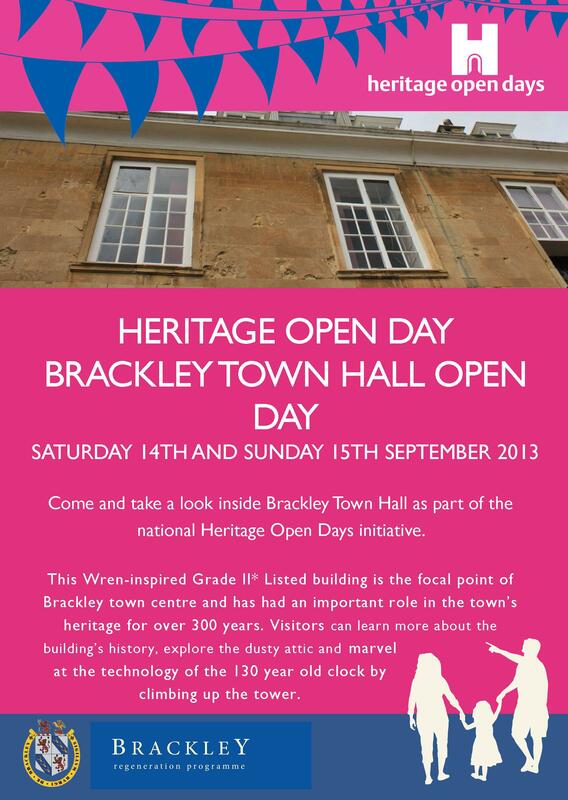 Come and take a look inside Brackley Town Hall as part of the national Heritage Open Days initiative. This Wren-inspired Grade II* Listed building at the heart of Brackley town centre, has had an important role in the town’s heritage for over 300 years. Visitors can learn more about the building’s history, explore the dusty attic and marvel at the technology of the 130 year old clock by climbing up the tower. As well as exhibitions and tours of the attic space, renowned local historian Professor John Clarke will be giving a seminar on the Saturday about Brackley. All events and activities are free during the weekend. Heritage Open Days is England’s contribution to European Heritage Days, taking place across 50 countries. Other events in the UK are Doors Open Days in Scotland (www.doorsopendays.org.uk); Open Doors Days in Wales (www.civictrustwales.org); European Heritage Days in Northern Ireland (www.ehsni.gov.uk); Open House London (www.open-city.org.uk).